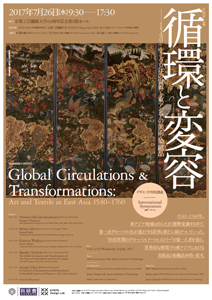 Symposium "Textiles and Materiality: Mixing Fibres between East and West, 16th-20th Centuries"
"Global Circulations and Transformations: Art and Textile in East Asia 1540-1760"
"Global Costume: Kosode, Dofuku, Banyan, Kebaya and Japanse Rok 1500-1850. 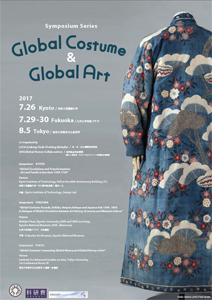 A dialogue of Global Circulation between Art History, Economy and Material Culture"
Tales of Trousers and other Things: A World History of Costume? "Global Costume: Connecting Global History and Global History of Art"
"Popularizing Fabrics and Clothing 17th-19th centuries: Materiality, Value Formation and Technology"
"Popularizing Fabrics and Clothing: Kyoto Yuzen Industry in Broader Context 1600-1970"
Writing for International Readers / Journals Workshop I "Kyoto Yuzen Printing & Dying Industry 1650-1970"
Lecture-Workshop "Silk-Weaving Districts in Modern Japan"
"Popularizing Fabrics and Clothing: Reconstructing What was What of Fabrics and Dress 1600-1930"
Lecture-Workshop "What was Cotton? 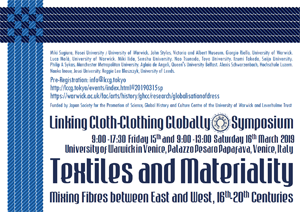 Fashion and Fibres in European markets, 1500-1800"
Symposium "Trans-fiber Approach: Reconstructing What Was What of Fabrics and Dress"
Writing for International Readers / Journals Workshop II "History of Dress in Global Perspective"
"Textile Industry and Fashion Business in the 19th and 20th centuries: International Comparison"
第32回国際ARCセミナー"Swiss Textiles for Global Markets. 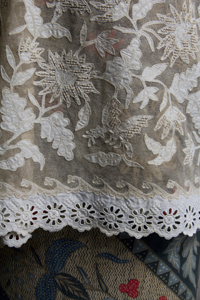 Design processes in the Zurich silk industry, 1800-2000"
"Fashion, Translation and Innovation. The Case of Belgian Fashion"
Since the six of Antwerp fashion has become increasingly important in Antwerp and increasingly Brussels, Hasselt and other cities. 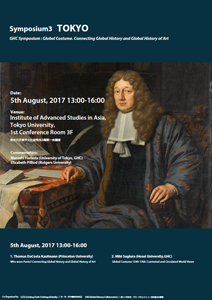 Antwerp fashion has attracted a lot of attention in the media and to some extent in academic circles (Bernheim 2008). In our analysis we follow existing studies focusing on the importance of regulatory framework or institutional intermediaries in creating a national fashion. However we also aim to study the elusive notion of ‘creativity’ and ‘inspiration’ with a particular attention for the translation of codes in different realms (Pang & Toprak 2016). Despite the general commercialization of the textile sector since globalization high end designer fashion actively engaged in the ‘re-artification’ (Van de Peer 2014) of their trade through a conceptual approach of fashion. The material culture around fashion and design have a type of text that expresses symbols and contributes to discourses and to cultural repertoires. 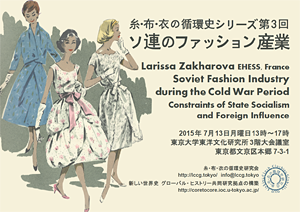 Fashion is a type of text that expresses symbols and contribute to discourses and cultural repertoires through the communication of the designers and fashion media. 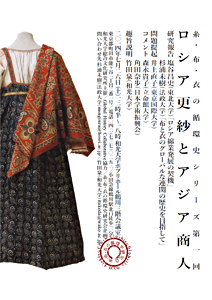 Workshop "Swiss-Japan Global Silk-Links, 1800-"
Workshop "Sarong Kebaya. 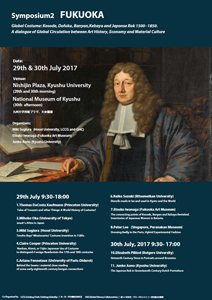 Peranakan Fashion in an Interconnected World"
Workshop "Transcending Fibers and Regions: Global Manufacture and Circulation of "Cheaper" Cloth-Clothing, 17th-20th Centuries"
Lecture Workshop "Patterns in 19th Century Japanese-Swiss Textile Exchange, as Seen by an Art Historian"
At the Section for East Asian Art in the University of Zurich, Switzerland, we have been engaged for several years in research that relate to 19th Century Japanese-Swiss textile exchange. 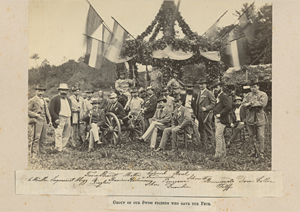 The exchange was a vital one that became enormously important for both parties - not only in economic terms, but also those related to arts and culture. 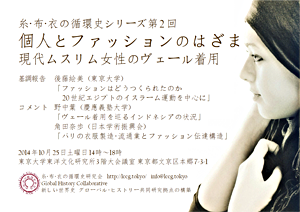 By exploring various case studies in Switzerland and also in Japan, we hope to cast light on various aspects of the trade and knowledge transfer that created both wealth and change in both countries. 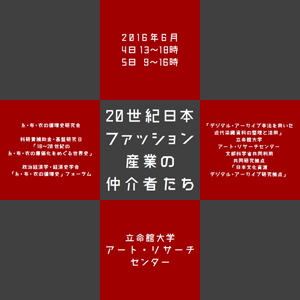 In today’s talk I will be focusing on four themes: Yokohama, Swiss industries, Swiss individuals active in Japan, and the objects brought back by to Switzerland. 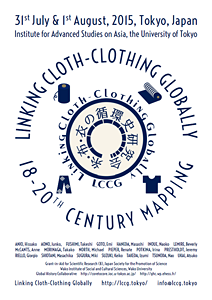 Symposium "Linking Cloth-Clothing Globally: 18-20th Century Mapping"
Session II: Mapping "the South" and "the North"
© Linking Cloth-Clothing Globally 2014-.